Betty Knoop was born in Amsterdam, The Netherlands. She was 8 years old when the Germans invaded her country. 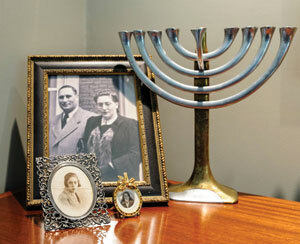 Her whole family was arrested and sent to camp Westerbork and on to Bergen Belsen concentration camp. She was liberated by the Russians and returned to Amsterdam. Her mother survived the camp but died 3 days after she was liberated. 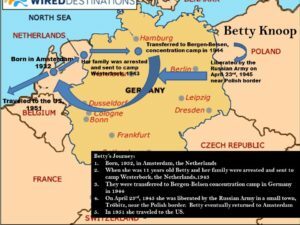 Betty was a contemporary of Anne Frank, lived in the same neighborhood and was deported to the same concentration camp. Betty Knoop's presentation covers life in Amsterdam, Westerbork, Bergen Belsen, concentration camp, life after liberation. Anne Frank has always been one of my heroines. Armonk resident Betty Knoop, who survived the unspeakable horrors of the Bergen-Belsen concentration camp where Anne Frank and 50,000 others met their death, has now joined that heroine list. Knoop, originally a Dutch citizen, grew up in Amsterdam. Though the two never met, like Frank, her childhood was cut short by the Nazis and she eventually was taken to the Bergen-Belsen concentration camp. Unlike Frank, she survived.